DRAFT 2009 – suggestions for developing this page are welcome! On the French national holiday, le quatorze juillet, July 14, 2009, a musical and cultural event in support of the CCS was organized at Mosebacke Etablissement in Stockholm. Many musicians and others performed, speaches were held, and jazz musician Claes Janson presented them all. A numerous audience enjoyed the evening and manifested their support. Media covered the event in several articles and transmissions. and there are fantastic fine photos of artists and speakers by Joar Jacobsson. Above find thumbnails and in the link the original pictures. Thank you Joar. When it comes to publications and opinion articles, as the planned closing down was of a national cultural concern we first tried the two leading Stockholm morning newspapers, Dagens Nyheter and Svenska Dagbladet, both declined publishing in spite of very competent authors. We however found to good channels, Uppsala Nya Tidning in the university town of Uppsala and very respected when it comes to cultural and research policy, and Göteborgs-Posten, the dominating journal on Sweden’s west coast and second city Gothenburg. I wrote a short opinion piece in Aftonbladet, August 12, 2009: ”Svensk posei i Paris ställs mot vårdbehov i Sverige” criticizing a writer for arguing in a rather populist way that as long as there were unsatisfied needs in hospital care in Sweden, money should not be used for something like a CCS in Paris. Swedish public radio, Radio Sweden broadcast several programmes on the closing and our Mosebacke event and articles. A direct transmission was made in the channel Radio Stockholm, interviewing singers Maya de Vesque, Claes Jansson and Åke Sandberg during the event preparations in the afternoon, which informed people about what’s on later that evening. And another interview came the following day in their programme ’Kulturnytt’ (Culture news), Sveriges Radio P1 July 15, 2009, kl 07:46. Here is Radio Sweden’s summary, in Swedish: ”Hotat kulturhus väcker känslor: Engagemanget är stort för det nedläggingshotade svenska kulturhuset i Paris.6000 medlemmar på internetsajten Facebook stöder huset, och en stor manifestation igår på Mosebacke i Stockholm ska uppmärksamma utrikesdepartementet på det lilla kulturhusets enorma betydelse. Men varför är reaktionerna så starka kring just detta kulturcenter i Paris? 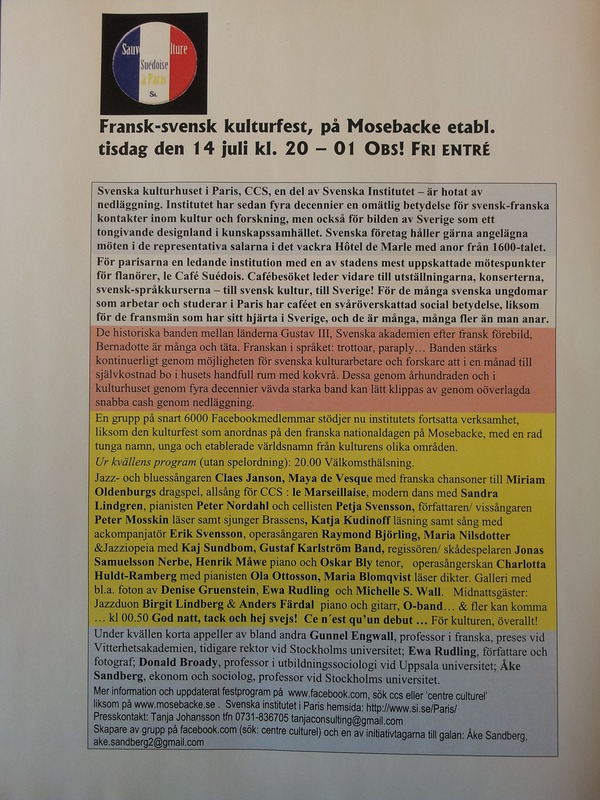 Åke Sandberg är en av arrangörerna till manifestationen för Centre Culturel Suédois. Load down Emelie Rosenqvist interviewing Åke Sandberg here Kulturnytt_20090715. As a background to both the articles and the manifestation at Mosebacke there was an active Facebook group – no new members are accepted. (but there is a new group, see below). It was created starting with my thirty something Facebook friends, and within weeks it grew to the substantial size of more than 7000 members, many of whom active in culture, research and media, and thus rather influential. The group was instrumental in developing a network supporting the institute. On the group page you will find many links, photos and postings of interest. Several members of the group contributed in organizing the Mosebacke event, writing articles etc, among them Christina Glaser, Tanja Johansson, Johanna Quigley, Claes Janson and Åke Sandberg. On the flyer you will find the names of the many artists and speakers that participated during the evening. There is also a new, similar group Soutenons/ Stöd Si Paris. It was started as a supplement. In FB groups bigger than 5.000 members the administators cannot communicate directly with group members, but in the new smaller group we can. We asked members to migrate to or become members also of the new group. New members are still welcome!